In 2 folders. Official copies of submissions sent to McIntosh by Committee Secretariat. Ordered into groups by McIntosh's personal staff. Folder includes listing of submissions. 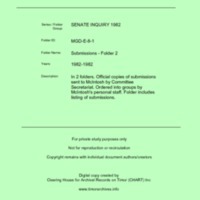 “Submissions - Folder 2 [MGD E8],” CHART DIGITAL, accessed April 18, 2019, http://chart-digital.info/items/show/659.